The Plain of Jars is one of the most important and mysterious megalithic structures in Asia. 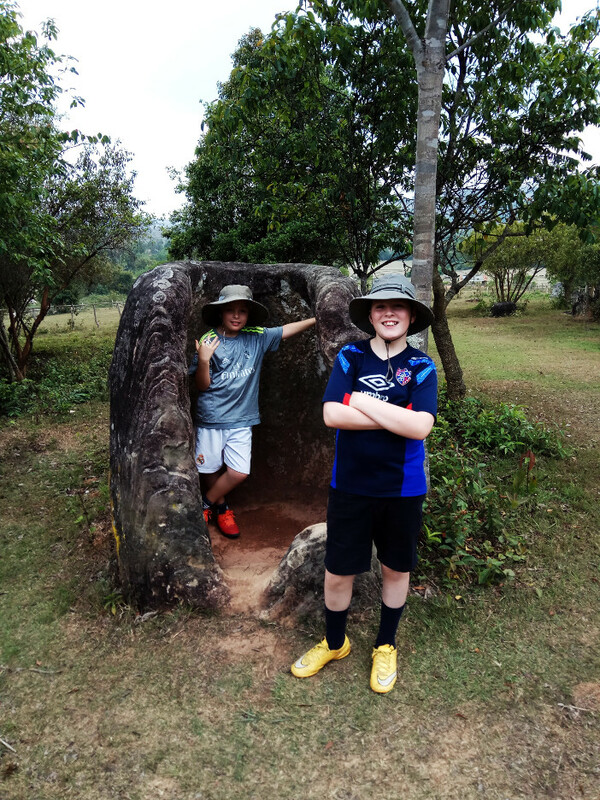 Thousands of huge stone jars lie scattered across fields in north-east Laos, though who made them and for what purpose remain subjects of academic debate. Yet the Plain also bears witness to a more recent and tragic history, the legacy of which is still causing death and injury to this day. The first challenge for visitors though is getting there. We had decided to make the short airplane trip back from Phonsavan to Vientiane, but hoped to travel there cross-country, so that we could see something of Laos along the way. The cheapest option is to take the bus, but we decided that a ten-hour trip on public transport was too much to ask even of our travel-hardened kids. In the end we booked a private minibus to take us there. This cost twice as much as flying would have done, but allowed us to take in the mountains, rivers, and villages, while still having room to move around and play games to keep the children entertained. We also booked a tour to take us round the Plain. Online research had led me to believe that we were not permitted to visit the jar sites without a guide; it turned out this was not the case, but you would need your own transport and a good map to get round unaccompanied. Our guide told us that he would first be taking us to a spoon factory, and my heart sank. Another excuse to sell the tourists overpriced souvenirs, I thought. But I was wrong. 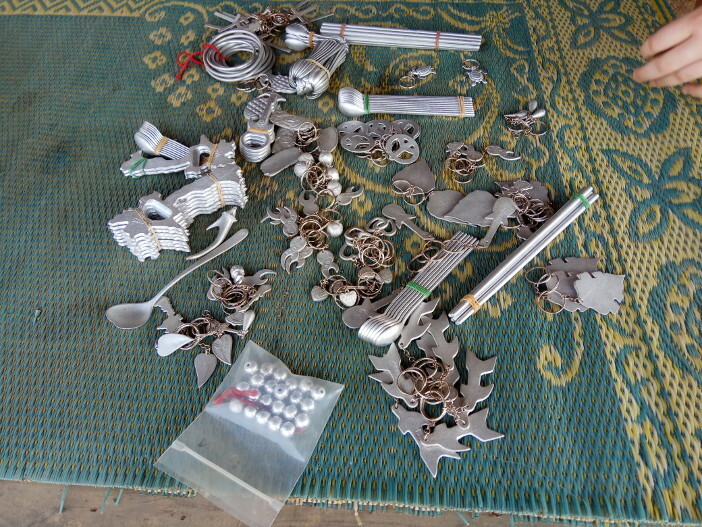 The spoons proved to be a fascinating illustration of Laos’s troubled history. During the Vietnam War, the communist rebels in Laos supported their comrades in North Vietnam, and the “Ho Chi Minh Trail” was used to move supplies and men south to make surprise attacks across the border. The American response was to bomb them: for nine years, an average of one plane-load every eight minutes, 24 hours a day. 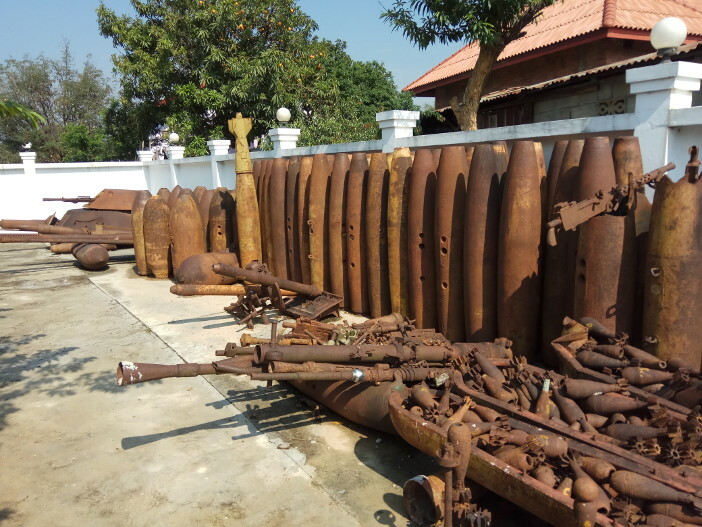 It’s estimated that more bombs were dropped on Laos than during the whole of World War Two. As much as 30 percent of those bombs failed to detonate, so that the Plain of Jars is now littered with unexploded ordnance (UXO). Children are still regularly maimed and killed while playing in the fields, after accidentally triggering leftover bombs from their grandparents’ war. One local decided to make something positive from this tragedy, and started making spoons from aluminum recovered from bomb sites. The “factory” was a small forge under his house (the living area is raised on stilts). 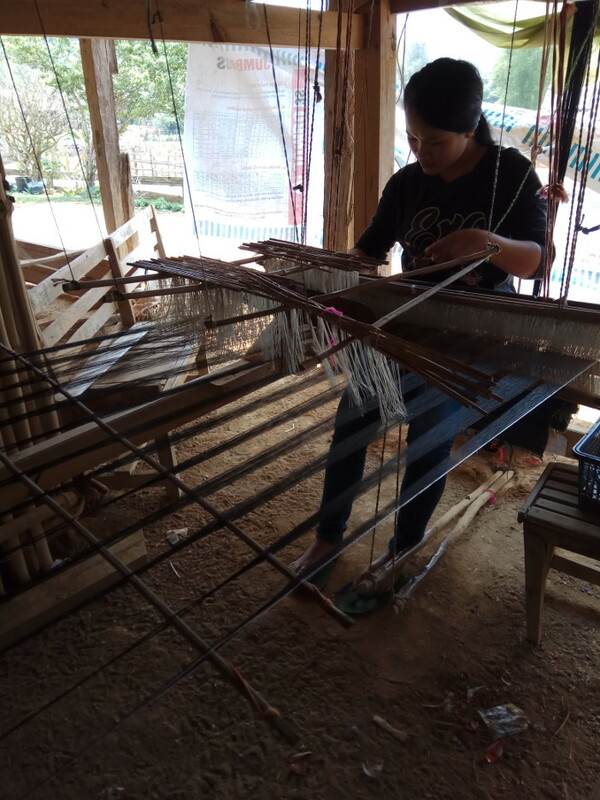 Others in the village took up the idea, though my wife was more excited to find women weaving beautiful fabric on a traditional loom, and to be able to buy the actual cloth they were making. 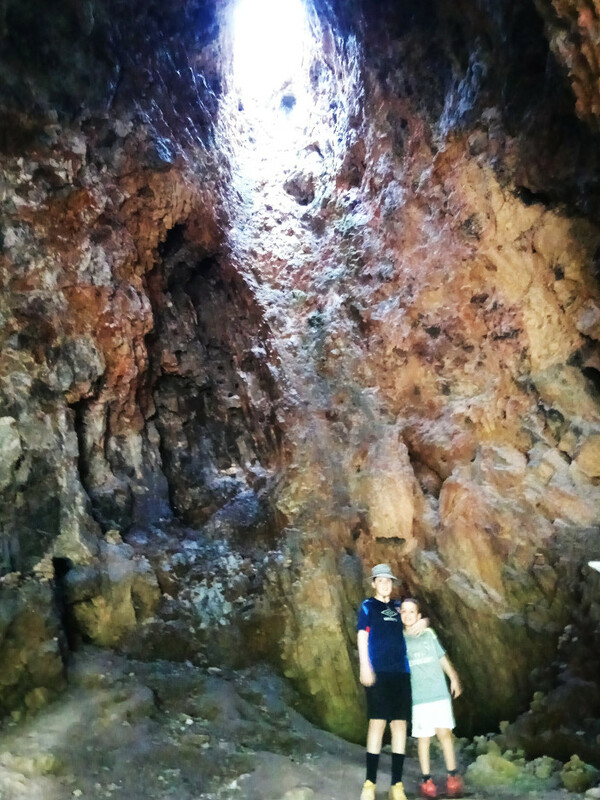 Three jar sites have been opened to the public, and we visited all of them. Each has their own attractions, and the scenery is breathtaking, its green rolling hills more reminiscent of England than anywhere else I’ve been in Asia. Archaeologists believe that the jars were used two thousand years ago to store the bodies of the dead while the flesh decayed; then, after a couple of years, the bones would be removed, cremated, and reburied in smaller ceramic jars nearby. At Site Number One, the largest and most popular of the sites, there is a cave which was probably used as the crematorium. However, investigations are impeded by the hidden dangers of UXO. We saw a team working on making a bomb safe, and later heard the controlled detonation. “That’s the first time I’ve ever heard a bomb,” my son commented, and we reflected on how fortunate we are that that was true for all of us. The locals face the problem with stoic good humor – we enjoyed excellent fish and chips at a cafe called Craters, named after the bomb craters which dot the landscape, and decorated with grenades and shell cases. But the UXO prevents agriculture from developing, and takes an appalling toll of deaths and injuries still. A visit to the UXO Center, run by the Mines Advisory Group (MAG), is an essential, if emotionally grueling, experience. International aid has suffered a blow to its reputation in recent years, with scandals rocking major NGOs. However it would be hard to find a better example of effective humanitarian work than that of MAG. They not only clear away the explosives, saving lives and freeing up land for development, they also provide jobs and training for local people. If you’re looking for a good cause to support, then they are well worth your consideration.